The liners are great. They are so comfortable and warm. So nice to wear under slacks while shopping. Love my pant liners!! They fit so well and are warm and comfortable. Thank you so much for selling this item !! I wear mine every day..!!! Years ago I was able to buy these in Nylon & they were longer. Really wish I could still get them in Nylon now. I have ordered several pairs of these and they are comfortable. I wear these when the weather cools down. They do help me keep warm without feeling as if I am bound closely with fabric. Love them. Excellent liner under white slacks - no see through shadows. Flexible - can be worn under other slacks to give some body. I liked it so much i ordered a black one also - and have mentioned product to my friends and ordered white one for a friend. Very pleased with product. She would buy theses again. She wears them under all her pants. These are very versatile and can be worn under skirts, and pants. This pants slip liner fits my height and weight PERFECTLY! Soft silky material, well-constructed! In fact, I'm here to order another! Very comfortable. It's exactly what I was looking for. Great under slacks for warmth. I'm glad I found this product! 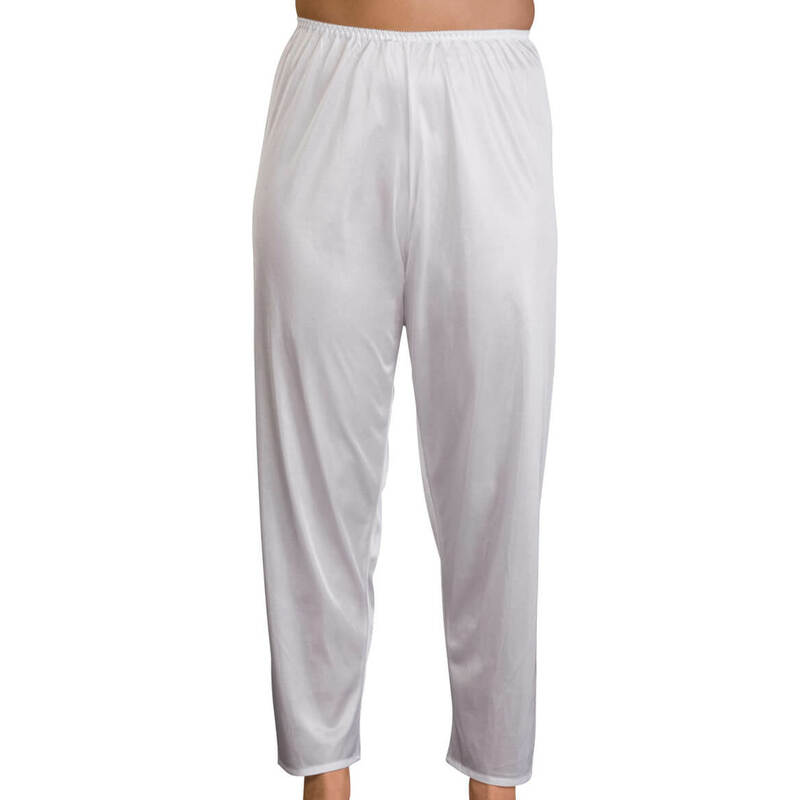 I have been looking for a comfortable pants liner to wear under a pair of white unlined slacks. This is the one. I use it under slacks for warmth in cold NW Iowa winters. a great idea if it were better quality and sized correctly. I thought that it would be made out of the same material as a slip, but the material is rougher, and catches on my pants hiking them up in places. These are perfect to wear under long skirts. I am cold natured, and bought this for extra warmth under my pants. Smooth under clothes and a comfortable fit. have white to go under dress in winter, need black for other dark dresses. I have had old one for 15years and still looks like new. It's lite, soft and moves well under pants or a dress. Need a liner for pair of white pants. I use them in the house with a long top. I chose these pant liner because I have one that belonged to my mother and I never got to ask her where she had bought and/or ordered it from. I am so glad I am able to buy one after nine years of my mother's passing. I have one of these pant Liner and I love it. Tried looking for this type of pant Liners for a long,long, time. I found this item in your catalog. Thank you Clara. I want to try it out under my jeans. Most jeans feel itchy and I want to see if they help. I purchased a pair of pants which fit great but are much too see-through for my taste. Since switching from a "jeans" wardrobe to dress slacks, I have found that a liner helps the trousers to hang properly and look polished. because of static cling in some pants. None other on market, like the fact it is not trimmed with lace. Wish you had half slips, cling free, just smooth with no lace, different lengths: knee length, midi length (to calf), and maxi length (to ankle), offered in black, white. Love these pants liners - great for long dresses and skirts, too! I like these because they are a comfortable and modest alternative to a long slip and warmer in the winter time. To keep warm on cold days wear under my pants. IT's what was wanted, had them before and LOVED them. In my dry climate, static cling is a problem and I wanted my slacks to not stick to my legs. I'm wearing these as P.J bottoms. Very comfortable and light to wear. I purchased this in black, so you cannot tell it's a pant liner. 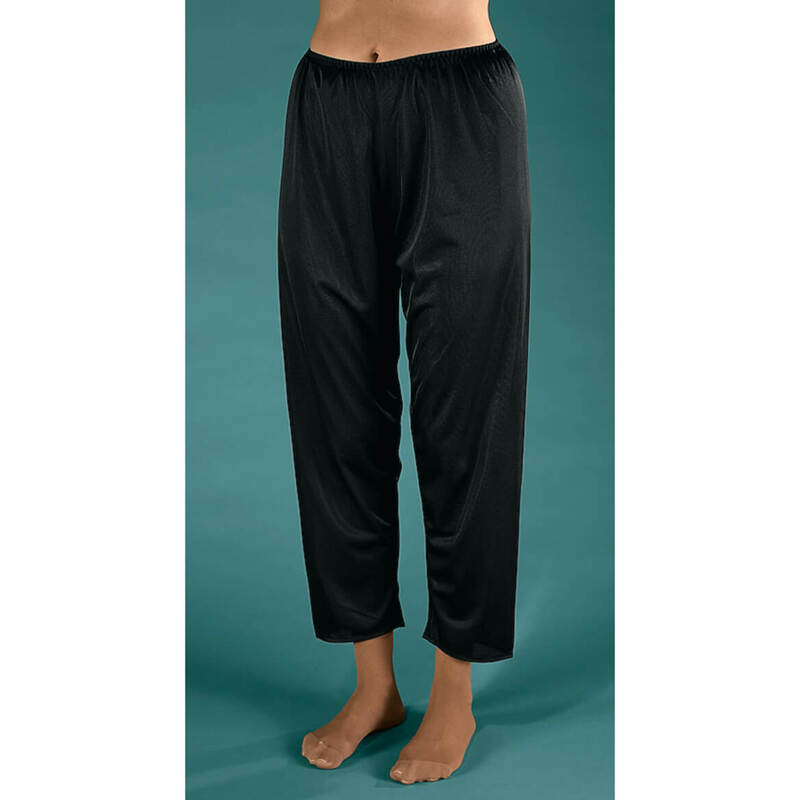 I choose this item because pant liners are great under pants in the winter because they keep you warm outdoors and comfortable when indoors unlike tights that can be too hot and itchy when indoors. This item is hard to find, not available in most stores. I like these. Only problem is no sizing chart so I am guessing. Please put a proper size chart for all clothing. I have a pair that is wearing out. Keeps my legs warmer than just wearing pants. have some like them and work well. I have several and needed several more I like the light weight. I needed them! Hope they are what I want. Have ordered before and back for more. doesn't add bulk under my slacks. Keeps me warmer without static. I am always cold but do not like traditional longjohns under my pants. These seem like a great alternative, and non-bunching, non-clinging. I think they will work great! I wear long skirts and dresses. I prefer the pant style over under skirts. I find the pant style more comfortable. I CHOSE THIS FOR COMFORT. I've been looking for non-tight fitting pant liners. They seem to be hard to find. These appear to be somewhat comfy. I was happy to find them. great for maxi dresses, and very comfortable as pj bottoms. Have looked for years for these. Always wanted to have a black pair. Is this item !00% nylon or is it 100% polyester? Both are listed in the description. BEST ANSWER: Thank you for your question. The Pant Liner is made of 100% polyester. We hope this information will be of help to you. I was interested in the pant liner for wearing under white slacks and saw one comment that they snag and made the slacks pucker . Others are buying them for warmth. I wondered if someone can tell me if they are hot to wear and if they really do seem to make the slacks bunch up.? 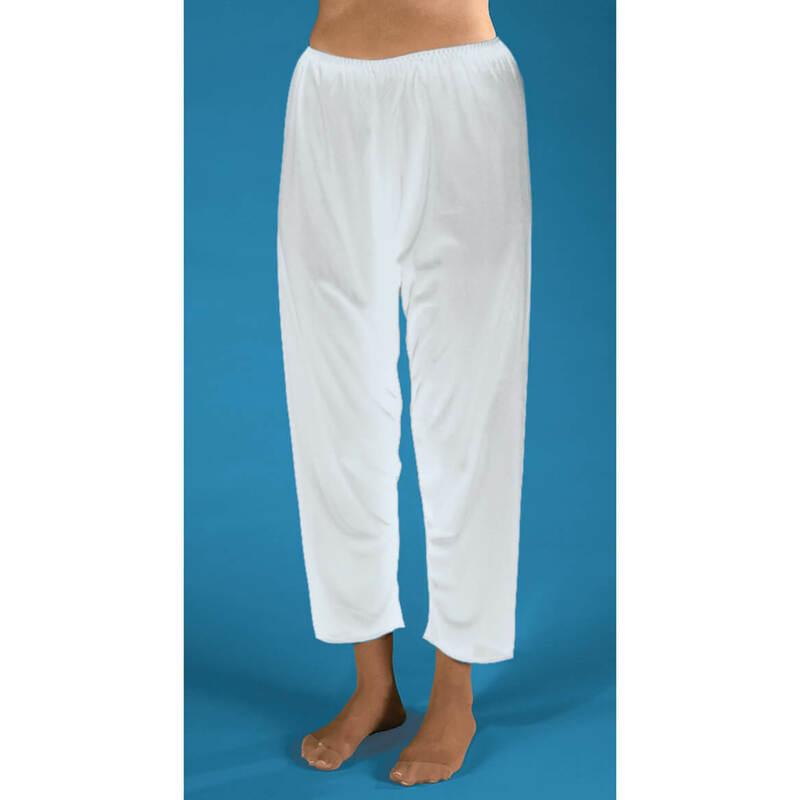 BEST ANSWER: I have used pant liners for years - for added warmth during the cold months and with white slacks. I have never had any problems with the puckering or causing any problems like that. My only comment was that the washing instructions say to hand wash and not to use a dryer. I have washed them with my regular wash and, if I remember, I let them dry on their own - although when I forget and they go in the dryer I have not noticed any problems. Nylon - possibly. Reminds me of the old slip material we used to wear. the liners seemed to ride up my legs - maybe even a 2X is too small??? I purchased this pant liner for wearing under a pair of Tai Chi white pants. The pant liner was very helpful because without it my Tai Chi pants will be too thin to wear by itself. The pants do not cling to my pants and they do not make my outside pants bunch up. They are very comfortable. I highly recommend these pant liners. I wear mine under my leggings and they do not bunch up they are very comfortable, and kept you warm,but not hot. How long are thes pant liners? BEST ANSWER: Thank you for your question. The measurements are below for all sizes. We hope this information will be of help to you. I am 4'10" and i wear med and it goes to my ankle. I love them. Great to keep jeans ink off your skin. Measuring from waist to hem they are 37.5 inches. I am 5ft 6 and they fit perfectly. They come to midcalf. I am tall so may be a little longer on someone else. They go to my ankle. No issues with them being longer than the pant leg. I am 5-5 and they were fine for me. Is the waistband elastic waistband covered by the material on the pants slip? How long are these pants liners? BEST ANSWER: Thank you for your question. We have included below the sizing, including inseam measurement, for this item below. We hope this information will be of help to you. My catalog says they are 100% Polyester... was wondering if I can get them in 100% Nylon, which I prefer? BEST ANSWER: Thank you for your question. We don't make the product, we just sell it. We hope this information will be of help to you. Not sure whether to order med 10-12 or lg 14-16. I wear slacks size 12. Is there a size chart I should check out? BEST ANSWER: Thank you for your question. We have included below the size chart for this item. We hope this information will be of help to you.